Members of ACORN in Hamilton gathered out front of the Ministry of Community and Social Services office at 119 King St. W. in downtown Hamilton on Thursday as part of a provincewide protest by the organization to highlight cuts to Ontario Works and the Ontario Disability Support Program made by the provincial government. ACORN members delivered broken heart cut-outs with messages that highlighted both the PC's decision last year to reduce a previously planned increase to OW and ODSP from three per cent to 1.5 per cent, and the decision revealed in January that MPPs would be getting a 20 per cent increase to their personal housing allowance. 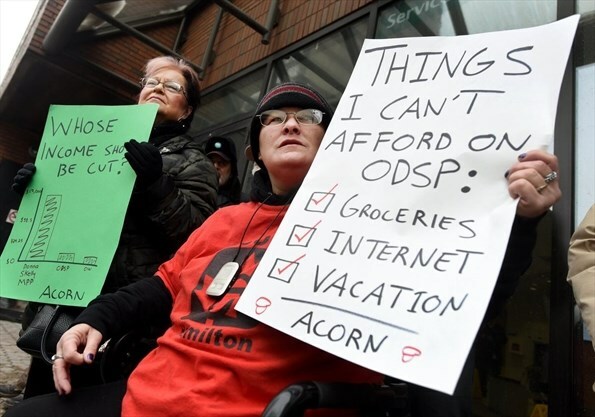 "Trying to survive on ODSP is becoming more and more impossible," ACORN member Raven Bridges said in a news release. "My housing allowance doesn't come close to covering what my rent is. It's frustrating to hear that MPPs gave themselves a raise and ignore everyone else." In the release, ACORN said they want the province to increase social assistance rates by $500 per month and apply a 20 per cent shelter allowance for recipients that matches the increase for MPPs.